As I sank my teeth into my free bagel this morning, I thought to myself,“It’s a Friday and I actually want to be here.” It’s clear my employers are doing something right. So I pulled out my notebook and started making a list of what I think makes Weber Shandwick Seattle great. Here they are. 1. Day in and day out we are stretched and challenged, mentally and creatively. Whether it’s giving a voice to Washington state park advocates or defining “the perfect business trip,” Weber Shandwick constantly empowers us try new approaches, push the envelope and think strategically. 2. The opportunity for professional growth is limitless. The exploration of my talents has had no borders since I started working at this agency. Four years ago I was starting my first day at Weber Shandwick Minneapolis and I now call Seattle home. I have a global network that will provide me with new opportunities and experiences should I want to pursue them. I have no excuse to be bored. 3. The entrepreneurial spirit is alive and well. New ideas are welcomed and encouraged. As a result, I feel empowered to help shape the future of my company – and if that’s not motivating, I don’t know what is. Last week my colleague Katie James and I attended the 2012 Washington’s Best Workplaces event hosted by the Puget Sound Business Journal. Sitting in the bleachers of Safeco Field, eating a hot dog and soaking in the sun, we were among more than 1,100 individuals from the top 85 companies that received the highest scores from – get this – their own employees. 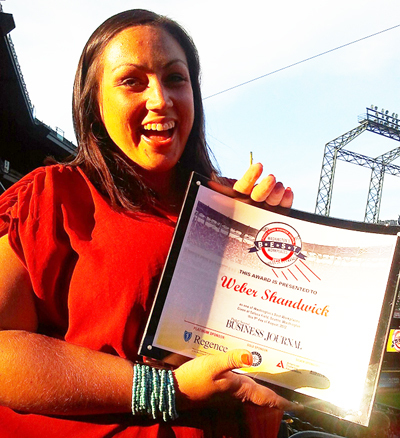 Katie James accepts Weber Shandwick Seattle's award for being one of Washington's best workplaces in 2012! Nearly 200 nominations were submitted on behalf of companies with Washington offices. Katie and I sat proudly representing our agency and as executives and employees got behind the microphone to share why their corporate culture is the best, it was refreshing to find myself nodding in agreement. Health care and 401(k) plans. Check. Office parties and free parking. Check and check. In a recent employee satisfaction survey conducted by Right Management, 65 percent of respondents stated that they are either somewhat or totally unsatisfied with their current job. So, given this sad state of the current job climate, what message can I send to employers? As a happy employee, what wisdom can I bestow? Here it is: if you want an upbeat, engaged workforce, find ways to help your employees feel challenged and reward them for their hard work. A couple of suggestions I’ve pulled straight from my experiences at Weber Shandwick: offer more training and educational opportunities and identify ways that they can pursue their personal passions. And for heaven’s sake, implement Bagel Fridays immediately! Tagged awards, Puget Sound Business Journal, Puget Sound Business Journal Best Workplaces 2012, weber shandwick.